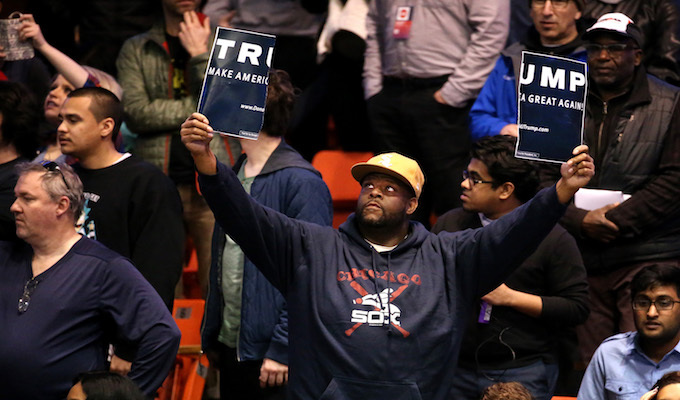 “This is what democracy looks like!” jubilant insurgents screamed last night as they lay siege to the University of Illinois at Chicago pavilion, effectively choking off the exercise of free speech at the Donald Trump rally. “Black Lives Matter” activists, Bernie Sanders supporters and other assorted “revolutionaries” then stormed the streets and tussled with police, Trump backers and anybody else who got in their way. Trump indicated to reporters on the plane ride up to the Windy City that he expected trouble, and why wouldn’t he? The mainstream media, the Twitterverse and political opponents continually paint the man as a Nazi and a fascist, so the angry mob is empowered to stomp on him, his supporters and their First Amendment rights. “No Trump, no KKK!” screamed the hooligans who pounded their chests while shutting down parts of the Windy City. And the hits kept coming: “Whose streets? Our streets!” and “(Expletive) the police!” filled the air as the mob moved to squelch alternative voices. On TV, police officers of different races protected themselves in tight circles against the crowds, while Donald Trump spoke by phone to Fox News. Donald Trump is taking the high road while his opponents softly sanction a movement of misplaced activism that routinely chokes off the real roads that hard-working Americans use. Social media and television exploded with anti-Trump folks celebrating the evening as a model of how to snuff out the Trump movement going forward. Meanwhile, the candidate himself is set to get the last laugh and he knows it. “They haven’t shut down the rally at all. It’s on television now, and we’re getting a much larger audience,” he said. Exactly. Sorry kids. That is what democracy looks like, too.